This year will probably see the return of Ethiopia and Algeria to the council. These powerful countries could bring clarity on what ‘strengthening the PSC’ might look like – something that has been mentioned as part of the AU reform agenda. But the real question that still bedevils the council’s potency is how countries and situations make it on to the PSC’s agenda in the first place. The move was also seen as Algeria’s attempt to ease tensions with Morocco on the Western Sahara question while at the same time eyeing the three-year term seat in 2019. Either way, Algeria’s main preoccupation this year is likely to be its presidential elections in April. Lesotho is currently the candidate for the Southern Africa region and indications are that South Africa won’t make a bid for the three-year seat this week. If South Africa were to rejoin the PSC, this would run concurrently with its two-year membership of the UN Security Council that started in January. A seat on both councils would give South Africa an ideal platform to weigh in on peace and security matters in Africa and to reaffirm its continental stature and global presence. The scheduled return of Burundi this year poses a challenge for the PSC’s work. The country was on the council from 2015 to 2017. If Burundi rejoins this week, it will be an interesting and concerning development given the dismal political, humanitarian and human rights situation in the country. A seat on the council would help Burundi’s government to continue to frustrate international, especially African, efforts to stabilise the Central African nation. Burundi’s return to the PSC is also symptomatic of the political dynamics in Central Africa and the issue of regional splits within the council. Countries whose undemocratic practices converge, often provide cover for each other on the PSC – which is part of the reason that Burundi is able to return to the council so easily. Meanwhile, Ethiopia has been front and centre since Abiy Ahmed came to power in April 2018. The new prime minister has put his country on a path to transformation that is felt both in Ethiopia and across Africa. Beyond internal reforms, Abiy ended a 20-year conflict with Eritrea, helping to lift international sanctions against Ethiopia’s neighbour. Abiy’s leadership could boost peace and stability in the Horn of Africa. Ethiopia might seek and perhaps just be handed a seat in the PSC, although Kenya and Sudan also seem intent on taking their place on the council this year. In these three cases and in Central Africa, the practice has been that regional blocs agree on who will take the open seats on the PSC. Apart from considerations of regional rotation and a country’s diplomatic capacity, regional political dynamics and states’ internal politics play an important role in getting a seat on the council. However, the very nature of the body – composed of sovereign states that favour consensus decision making – affects its ability to deliver. The regional configuration of the PSC entrenches practices where countries band together to prevent certain conflict situations from featuring on the council’s agenda. Often, for a country or situation to get onto the PSC’s action list, the regional bloc to which it belongs has to raise the issue at the council. The problem comes when several countries in a bloc demonstrate undemocratic behaviour. A conspiracy of silence then takes root, which prevents crises from coming to the attention of the council for potential action. The case of Cameroon is one example. 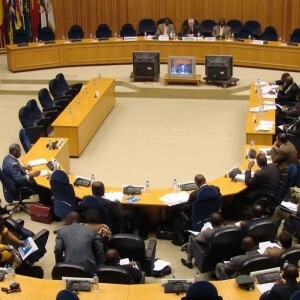 The Central African country has been steeped in turmoil, including during recent presidential polls, which should, at the very least, have been discussed at the PSC. The council’s silence on certain countries, notably in Central Africa (a region prone to instability and questionable governance), shows that serious thought is needed about how a country or situation reaches the council’s agenda.